The site's design is very colorful yet very easy on your eyes. At first look, you can see the wide variety of services that the site offers and it's effortless to find the exact service that you need. It has a huge range of social media services (Facebook, YouTube, Twitter, Google+, Vimeo, Soundcloud, Pinterest, and Instagram) and is so easy to use due to its flow and intuitiveness. The front page also features a pricing list right at the start, which we found was excellent and time-saving. You could say that the site is dumb proof. This seller's prices are pretty high compared to other sites we have reviewed before. Viralkick.com offers a minimal amount of subscribers, likes, comments, and views, which we found very disappointing, but you can always make numerous orders to compensate if you need more than they can offer per single order (which also forces customers to spend more money on the site - clever guys!). We have to say that it was pretty easy to make an order, the only thing is that their estimated delivery time seems very long when compared to competitors and we don't really understand why that is. 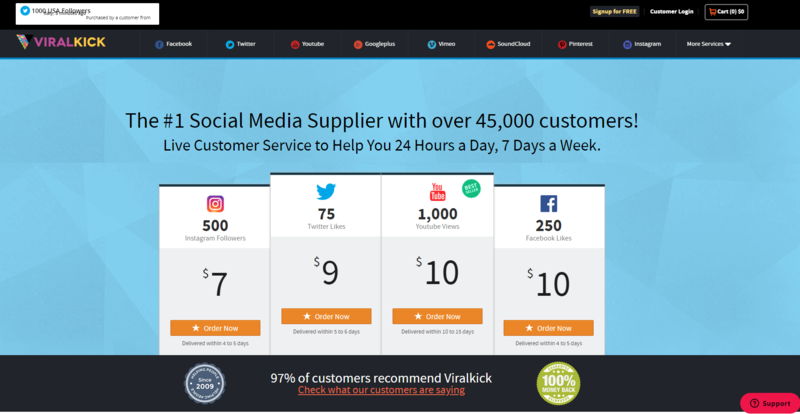 Viralkick.com accepts payment only via Visa, MasterCard, American Express, Debit cards, and PayPal, and they offer 100% money back guarantee for 60 days after purchase or if your order hasn't started 48 hours after placing it. You can also request a refund within 2-5 hours after placing the order. We actually liked how simple and understandable their refund policy is, and it truly seems that they care about their service and their customers. We've made a few orders of YouTube subscribers, likes and comments through the site. The comments came in the exact time as they said they would, without any problem, but the subscribers and likes orders took way longer than we expected (more than two weeks - which is basically unheard of and could terrify new customers expecting to fully receive their orders immediately or at least in the span of a week at most). So, we'd suggest their service only if you have the time to wait and want to grow very, very slowly - but it wasn't to our satisfaction at all. Upon receiving all of our orders, this supplier had experienced a serious drop with our likes order. About 430 likes were dropped from a total of 750 ordered. That was very disappointing and quite unnerving since they said that they have the most professional service and "rarely experience drops". After contacting their customer service they offered us a refund which was fine but it was unfortunate that they couldn't fully commit to the order after making such grand promises on their website. Viralkick.com has a convenient way to communicate with their support team by a little 'window' that you can leave messages in. The only thing is that when we needed them to refill our likes order they answered us in a serious delay (which was rather unnerving for us). That is why we chose to receive a refund and forget about our ordered likes altogether. The services description is pretty good. 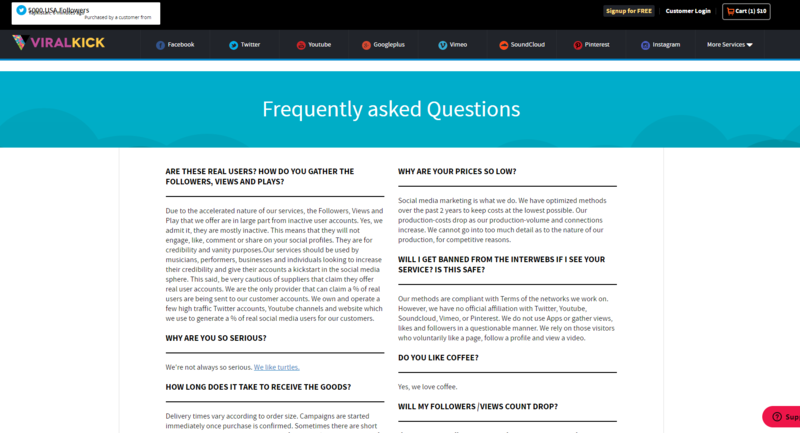 At the YouTube Service FAQs, you can find lots of information about their services, such as the benefits of buying YouTube services and how do they work. The information is written very clearly and is very easy to read and understand even if you're not a native English speaker and we loved it. The only thing that we would suggest for improvement is to arrange the FAQs in subjects for an easier read. Our final score is 70/100. The 70 points go to the nice design and for the abundance of helpful information on the site, as well as the readability of the content and how accessible it is for worldwide users and non-English natives. Their service, however, wasn't as good as we hoped it would be and really affected our final scoring - with the serious drops, disappointing support team, and high prices that we feel took a great toll on our overall experience as customers on this website and really disappointed us as customers. We probably won't use this supplier on a regular basis because we just don't feel like we can trust them completely.